i have a lead on some rear springs off a 91 suburban, anyone know if those will work? follow me! if ya got big enough nuts! if ya cant pork a princess, pound a pig!!! Lower the standards, raise the average! You could also buy aftermarket 1-2" lift 63s to gain more height. good info I'm gonna get some and try it this weekend. ........Or if you've got access to a press and alittle patience, pull them apart and re-arch them to a few inches over desired ride heighth then reinstall and flex the out of them. Should settle relatively close to where you want them. Nice truck man... Do you have a build thread?? I am collecting parts for my 2000. Got the 63s for free and bought Ruffstuff frenched hanger kit. Need to box my frame first. And learn how to weld. Nope Not really, I could try to piece something together. Didn't think about documenting it while I was putting it together......Helll who am I kidding I am still putting it together, They are never really done, just in between mods. I built my front spring from three different sets of rear springs. I just cut and fitted them till it looked like what I wanted. Not very scientific but hey......They work. That is how most of my truck has been built, Read some here, read some there, Get out the torches, Bust a knuckle or two. Go try it out break something.......... You know fun stuff. Can anyone confirm this PN# for replacement spring bushings on the 63"s? From Energy Suspension.....I'm fairly sure it is correct. The stocks have a metal sleeve outside the bushing though. I got the # from the swap thread on Pirate. PN#3-2128.........Bushings for both ends of the leaf and not the shackle. Has anyone used these? Should I just get Napa ones? A place called the Hobbie Shop in Winchester Ky, He has gone under thou. It's a shame what happened cause the guy can do great work. I guess I'll go Napa. I forgot I need the external metal sleeve, as well as the internal one for the bolt. No sense spending $50 on poly bushings and still need to source the sleeve separately. has anyone used the chevy 63 spring hanger kit from inchworm. If so have yall liked it. Same as Ruffstuff looks like. Description is the same too. Not on my truck yet, but they are SOLID. Got a buddy of mine new to toys. He picked up a set of 1T chevy leafs and is going to use them. I've never heard of this on a Toy. My Chevy's work fine, but I am going 4" in the front and 2"lift blocks in the rear. Hey guys, just did the swap yesterday(double shackle), I have yet to put in my rear shocks. I took it for a test drive and I feel vibration in 1st/2nd gear. Goes away once I shift to 3rd. Vibration feels like it's coming from the front so I don't think its my driveshaft. Any ideas? I just put in new cab mount bushings but I dont think that is the cause either. I torqued all bolts to spec as well. Check your pinion to make sure it is right. My ruff stuff ideal 63 kit shipped yesterday. I opted to get the new extended perches and shock mounts for the axle and frame. Their stuff is very beefy and they come with all new poly bushings for the leafs and a u bolt flip kit. Right now everything is 15% off and the shipping was very reasonable. I'm currently building towards dual cases on my pickup. 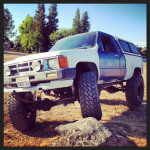 The chassis is from a 93 regular cab pickup, and I'd like to use my original driveshaft. I'd also like to do chevy 63"s at the time I add dual cases so that I only have to worry about getting my front driveline made. I'll probably flatbed it, but I'd like to move the rear axle back the same distance that marlin's adapter and a second case will move back. My question is: How far forward do I weld the chevy leaf hangers if I want my axle to end up 6.5" back from stock? I know that this FAQ said for stock axle placement, move the hangers 9" or so forward, but is it as simple as subtracting the two? So about 3" forward? I'm asking because I think there's a few more angles at play here, and it kinda looks like I might need to cut off the stock hangers in order to get the chevy hangers where I want them.. I don't think you can manage 6.5" unless you put your shackle hangers on a new cross member hanging off the back of the frame. I've used them a few times and We can typically get maybe a 3" wheel base stretch with the shackles way back on the frame tails. Shortening your rear shaft is a piece of cake too. Grind off the old weld carefully, then just use a pipe cutter and the yoke will press right in strait, then weld away. I have yet to mess one up to the point it vibrates. you have the brackets already? I have some to sell. It's from Hawaii though.